If you are passionate about archery and you are looking for a good hunting crossbow to practice with, then you surely know that it is crucial to invest your money in one that is durable, efficient, lightweight and reliable. The Excalibur Matrix 355 is one of the most sought-after crossbows of its kind on the market, it comes with a Tact-Zone, five-reticle scope and it specifically designed to ensure easier cocking, to enhance the shooting accuracy as well as to improve balance and to reduce the recoil at the same time. That being said, this review will detail the mechanism of action of this crossbow, as well as its advantages and disadvantages. How Does the Excalibur Matrix 355 Work? The crossbow relies on what is known as Compact Recurve Technology, and it has an incredible speed of no less than 355 feet per second. 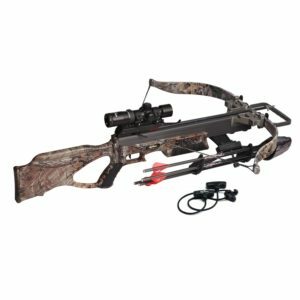 In addition to this, the crossbow is specifically designed to be user-friendly and easy to assemble and use, thanks to its ergonomic design and its quad-loc riser. The crossbow can be used both by professionals and by beginners alike, it has a mass weight of only 5.4 pounds and it uses 18-inch long arrows. When it comes to the mechanism of action of the Excalibur Matrix 355 crossbow, it must be said that the scope requires little to no adjustments, given the fact that it illuminated and it is designed to enhance the visibility even in very poorly lit environments (thus allowing you to easily use it during the night). The crossbow comes with multi-coated lenses that offer you a very clear and crisp image, and it also comes with 4 screw-in field points that are durable. The Excalibur Matrix 355 is very versatile and adaptable, which means that with the right accessories, you can easily turn it from an archery-only crossbow to one that is suitable for hunting. All you have to do is to purchase broad-head arrows that are specifically designed for hunting. The string of the crossbow should last for approximately 1500 shots, provided that you keep it properly waxed in between each shot. The crossbow has a sturdy construction that makes it very durable in the long run, and one of the most notable aspects is that its construction is designed to reduce hand fatigue by distributing most of its weight in the back of the crossbow, which not only makes it very lightweight but also very comfortable to hold and use at the same time. One of the main pros of this crossbow is the fact that it is very easy to use and it is very low-maintenance as well. Being designed to be used on distances that exceed 70 yards, the crossbow is very accurate, it has an outstanding performance rating and it has a very user-oriented scope that requires very little adjustment – the crossbow can be literally used right after unpacking it. The crossbow is perfect for target practice, and it also comes with 4 well-designed arrows that you can use during the training. At the same time, the crossbow has sturdy limb pockets, it has a large and comfortable foregrip and it also comes with powerload limbs that certainly exceed one’s initial expectations. The wide shoulder plate is yet another notable advantage of the crossbow, as it is specifically designed to prevent the bothersome recoil that occurs when shooting, while ensuring a superior degree of comfort as well. On the other hand, the product does have some downsides as well, and one of the main disadvantages is that it does not have an anti dry firing system, which means that the user must pay attention when cocking it. At the same time, some users report that the string noise coming from the crossbow is louder than they expected, and the fact that the package does not include a string silencer (which can be purchased separately, though) can be regarded as a disadvantage. To conclude, the Excalibur Matrix 355 certainly offers a great value for the money – cost-effective, feature-rich and very versatile, the crossbow can be used regardless of the weather condition, it is powerful, it has a dependable trigger, an ergonomic design and an overall comfortable shape that adds to its accuracy and to the clarity of vision. This crossbow has everything a passionate archer is usually looking for in such a product, except for the special hunting arrows which should be purchased separately, if case.